I am loving this pretty pink cake with hand-piped red roses. It’s so pretty and elegant. And, believe it or not, this gorgeous and somewhat abstract wedding cake can be a DIY project. That’s right! If you – or someone in your wedding party – is feeling particularly ambitious, this is a cake that you can create by following a few simple instructions. There’s just something about the color yellow – it’s so bright and cheerful and instantly puts me in a good mood. The same can be said for this wedding cake. It’s bright and cheerful and very elegant. What is the last thing you’d think of when deciding on the perfect wedding favor for your guests? Miniature garden gnomes, of course. Everything is coming up roses (and violets, pansies, lavender, and cornflowers) with this stunning wedding cake! 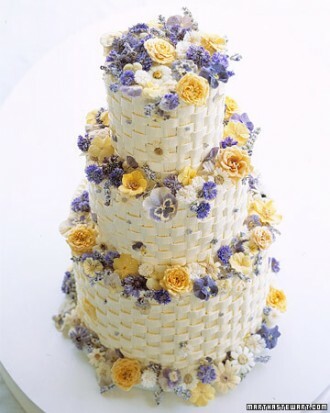 I absolutely love this cake because it elegantly screams ‘spring!’ and because those are real flowers that have been crystallized with sugar. Today we’re not talking about wedding cakes – well at least not the edible kind. 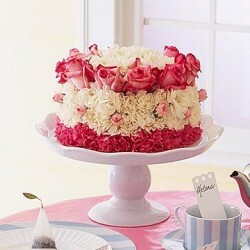 I saw this wedding cake bouquet centerpiece the other day and I just had to share it with you! Everything is finally blooming around here and I’m in the mood to plant flowers! 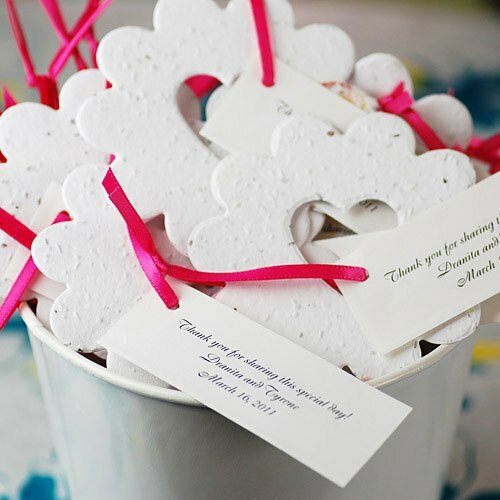 Which got me thinking – I bet the guests and your spring and summer weddings want to plant flowers too. 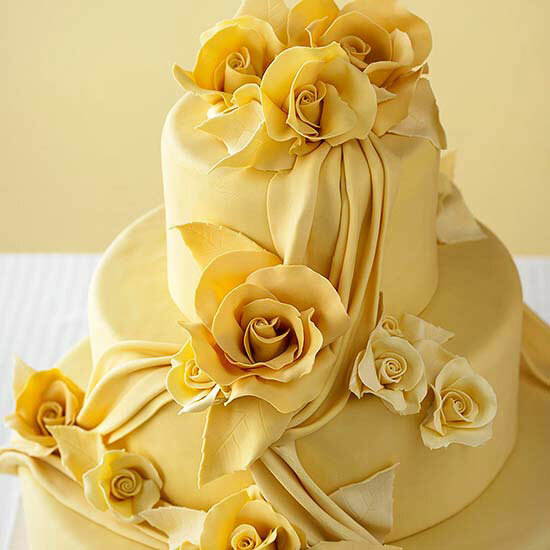 Since your wedding cake is the centerpiece at your reception, it makes sense to pick a cake that will make you and your guests smile. 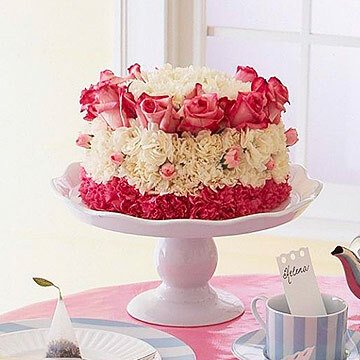 This super cheerful – and very pink! – wedding cake fits the bill. 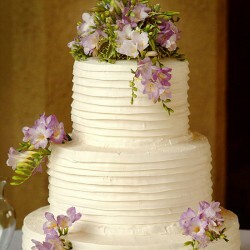 I am loving the simplicity of this cake. 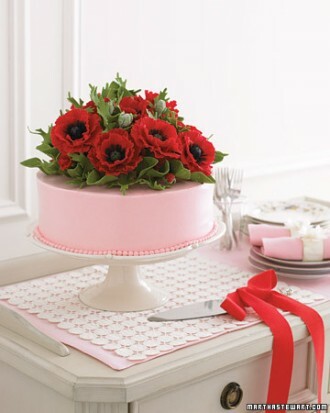 One tier, pink icing, and fresh poppies. Sometimes all it takes to make a cake stunning is a simple design and some fresh flowers. 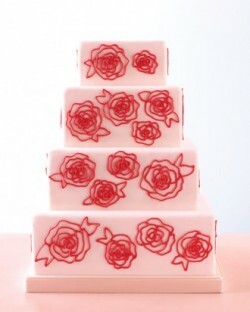 Take this cake for example – the icing is simple and the only embellishment is fresh flowers. That’s it. 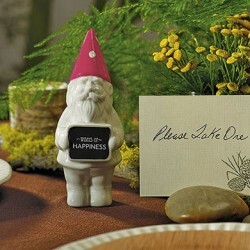 In my quest to find fun and unique wedding favors sometimes I find a favor that even I can’t believe really exists. 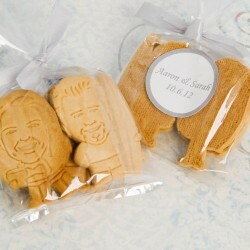 Today’s wedding favor falls into that category – customized cartoon cookies. Until recently I never would have considered chocolate frosting on a wedding cake. 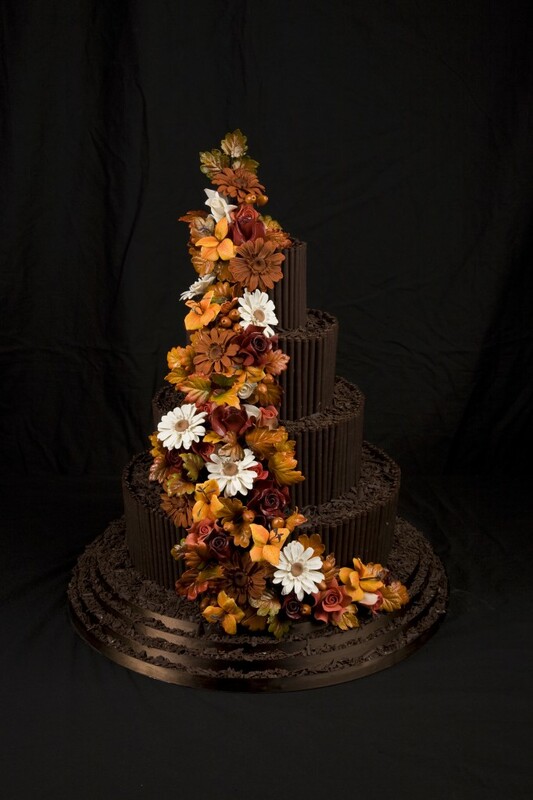 Don’t get me wrong – I love chocolate – but I always thought wedding cakes “had to” be frosted with white icing of some kind whether it’s fondant or buttercream. Well, I’m happy to report that I’ve changed my mind and if I had to do my wedding cake over, it would be all chocolate.